The HTC One M9 is probably the less exciting of the two flagship announcements we got at MWC, but HTC's US president Jason Mackenzie says you're going to love what they announce on Wednesday March 18th. That's the same day T-Mobile plans to have an event in New York with the slogan "This one's a real piece of work." Related? Maybe. There's no guarantee that T-Mobile's Wednesday event is going to feature the M9, but it would make sense. T-Mobile is expected to announce more "Uncarrier" moves and some special deal on HTC's new flagship could be part of that. 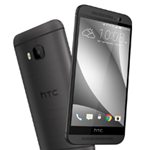 HTC could certainly use a boost for the M9, which will be going up against the Samsung Galaxy S6 this spring. If nothing else, we'll probably learn about M9 availability this week. The T-Mobile event starts at 12:30 PM ET, if indeed these two things are related.